COLFAX Iowa Sticker - $20.00 : Bob Hoyts Classic Inspection Stickers, Add a Final Touch to your Restoration! 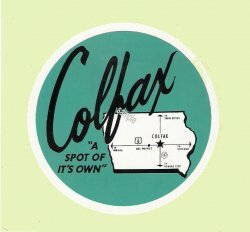 This Colfax Iowa is a really unique sticker especially if you are from Colfax Iowa. We don't know the vintage but are quite sure the town is still there.